Enhance this high point with a cloud that gently floats on the surface of the dancefloor! 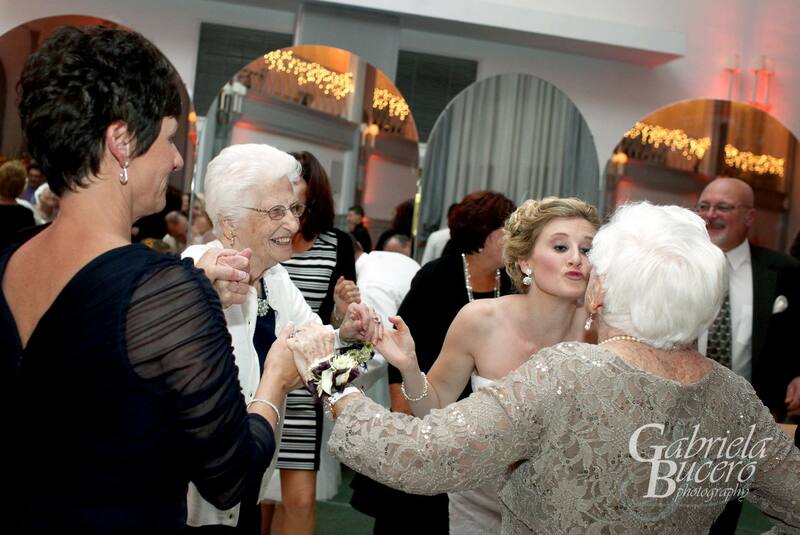 You and your guests will remember that moment forever! Congratulations Caryn and Bob! This is such a beautiful setting! While it is happening, you can hear gasps of delight from guests! 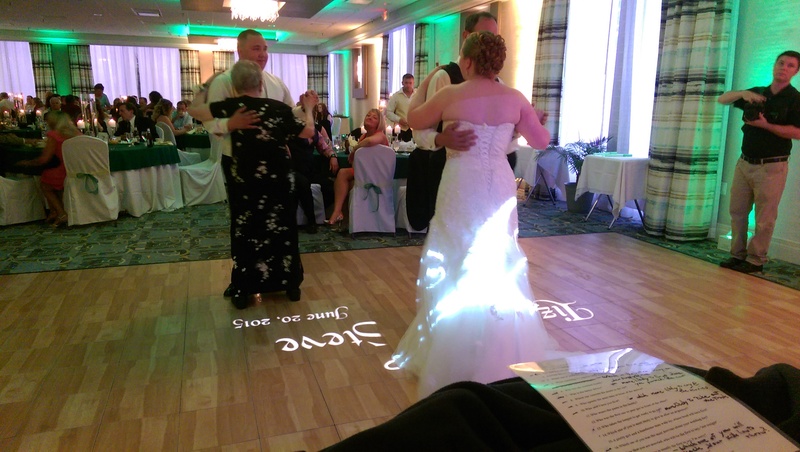 Caryn & Bob’s names and wedding date are reflected in the mist where we projected them on the dance floor. Their wedding colors are complimented by our uplighting in the background. 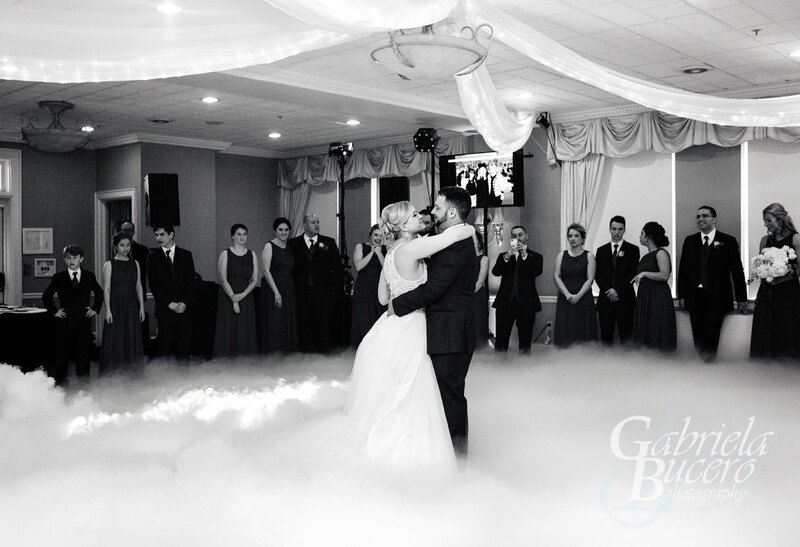 Here we are at Traditions at the Glenn Resort in black and white for that timeless memory feel. Congratulations Mark and Emily! What a beautiful wedding reception! Floating in the background, you can also see our elevated flat screen to project a slideshow and pictures from the photo booth. Another angle and in color! Notice how the cloud enhances the feeling! 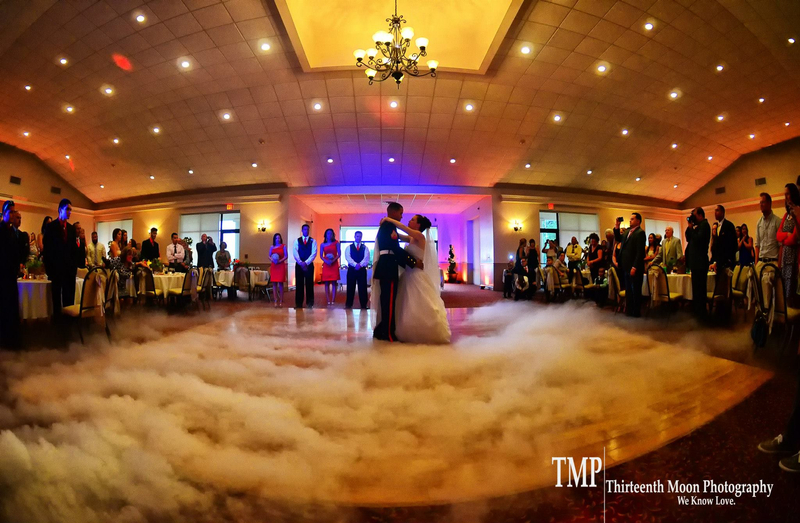 Ask us how to get this effect included into your wedding package! 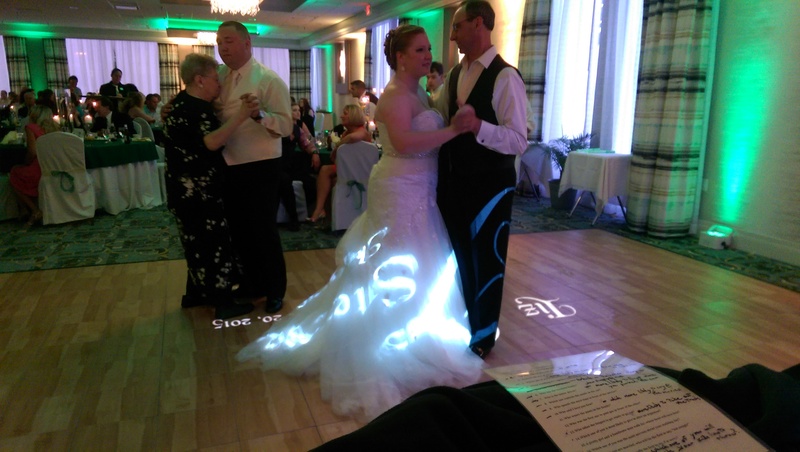 Projected monograms and projected images can really enhance your wedding reception by emphasizing your colors and themes. Here is an example of that shown on the wall, dance floor and flat screens. This can work for any type of party where you want a personalized touch. You can even use it with a silent disco theme. 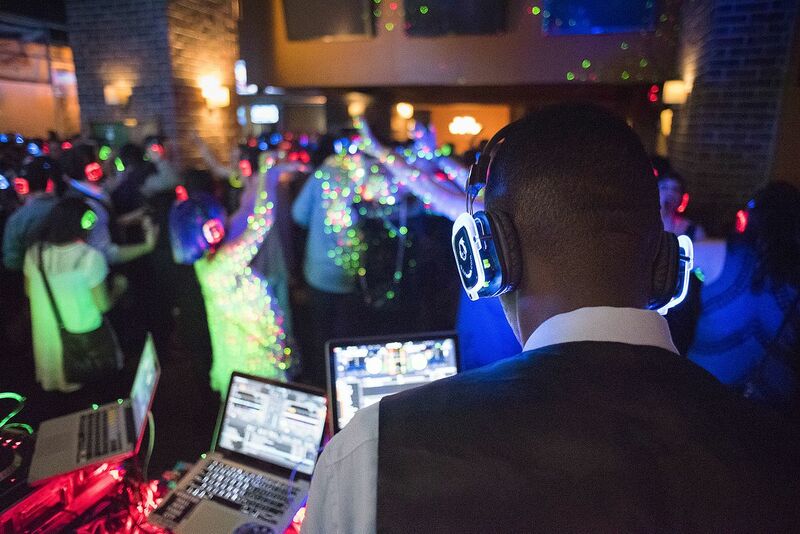 Why You May Want Silent Disco at Your Wedding Reception. Silent Disco is endorsed by Martha Stewart’s Wedding Magazine as a hot, growing and incredibly fun form of reception entertainment. Silent Disco is also listed by Wedding Wire as among the hottest reception trends for 2017. What is the biggest concern for all guests at all weddings? They are worried the music will be too loud to talk. With Silent Disco they ask, “how can people talk with headphones on?” Then they realize that the headphones can be easily removed for a quick chat in a normal conversational voice. This is much easier than having to yell in order to be heard over the typical sound system at full dance volume. The biggest reasons that guests leave is that the music is too loud for them to talk to each other. With Silent Disco formats, that doesn’t happen. Not only do the headphones have an independent volume control, but the traditional sound system is playing quiet pleasant background music to enhance conversation; -it is never too loud. Headphones have independent volume controls, three channels & change color to show which one you are listening to. Especially if your reception is outdoors or in a location that has noise ordinances requiring the loud music to shut down at a certain time; Now the party can keep going as late as you want it to. Outdoor receptions, barn receptions, and even hotels that rent rooms within earshot of the banquet hall benefit from Silent Disco. 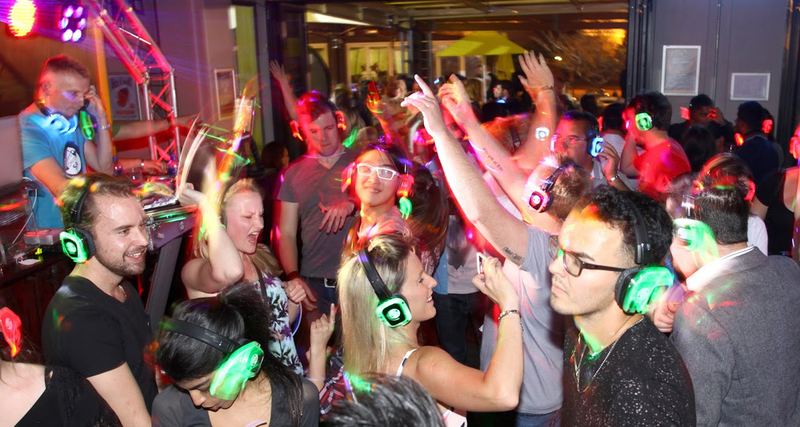 How does Silent Disco work at a wedding reception? Usually there is a traditional sound system for the cocktail and dinner music as well as for the introductions, announcements, and special dances. The sound system continues to play soft music throughout the reception. Guests use the headphones when they want to dance. The headphones have independent volume controls and three different channels which allow three different dance types to play simultaneously. Often, one channel is the Bride’s playlist, the second is the groom’s playlist, and the third is the live DJ taking requests and reading the crowd. The headsets light up in a different color to show which channel guests are listening to. You can literally be dancing with your partner who is listening to a different song. Want to learn more about my Silent Disco? I have it available for you on this page. 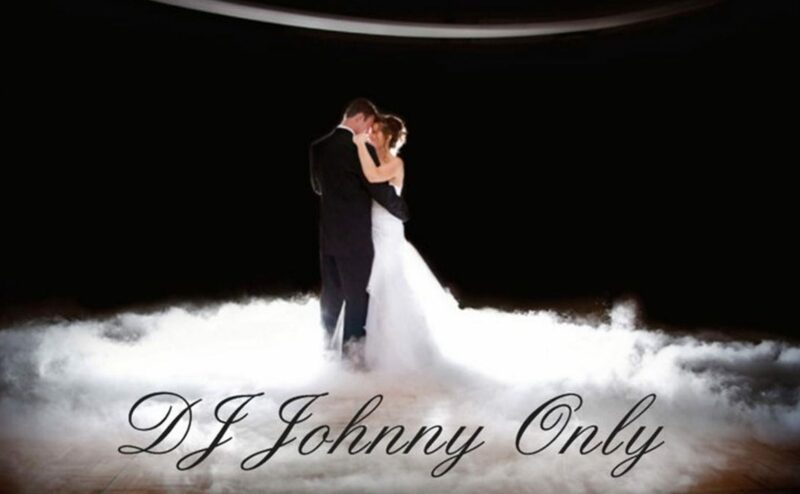 You already have your DJ and just need to rent the Silent Disco Equipment? I can help you with that too. Check here for prices and how my rental works. Here is an article from the New York Times describing their take. 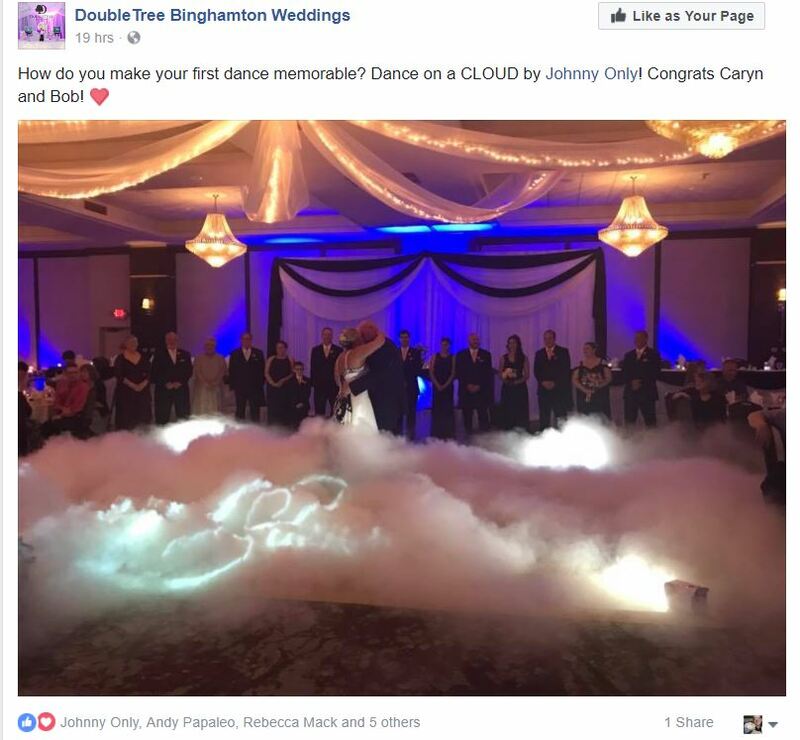 Would you like your first dance on a cloud? 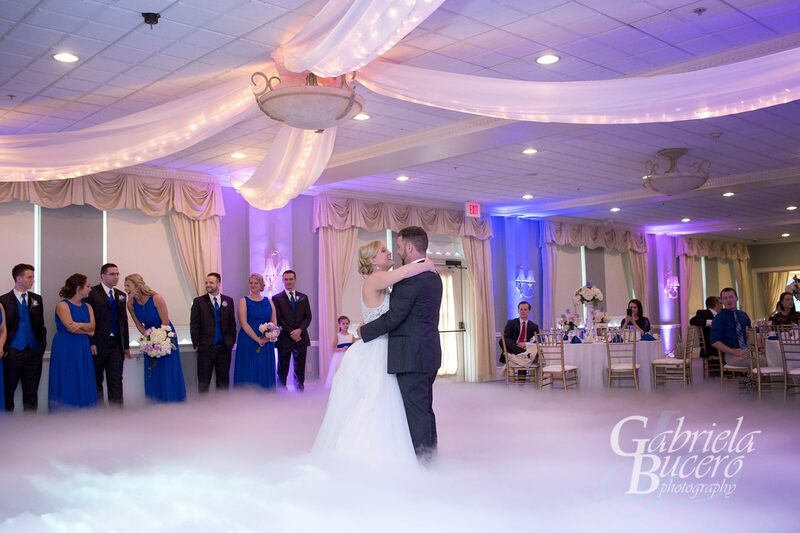 I bought the best dry ice fog machine on the market just for you! Your guests will be amazed at how beautiful you will be! This is the type of fog that stays down low, so you don’t have to turn off the fire alarms. It is nothing but condensation from dry ice placed in hot water. 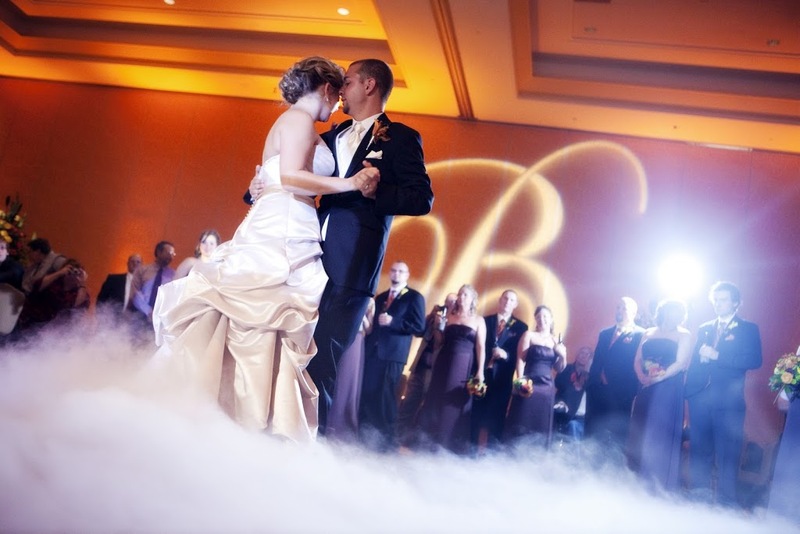 It is odorless, dissipates quickly and is breathtaking enhancement of for your first dance as husband and wife. It is a 175 dollars of breathtaking awesomeness that will make your first dance unforgettable! Ask me about my introductory price and you will be very glad you did! I can’t wait to see to how amazing your first dance will be! This was a beautiful fall-themed reception complete with uplights to compliment the colors that Michelle and Mike had chosen. My projector and flat screen filled out the visual effects. We used a slide show on the elevated flat screen to enhance the impact and memorability of the parents’ dances. 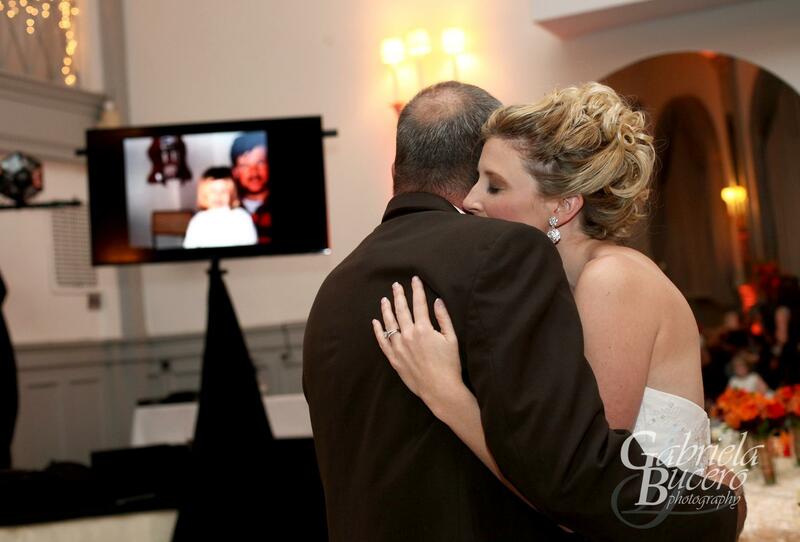 Pictures of the bride growing up were shown during the father-daughter dance and pictures of the groom growing up were shown during the mother-son dance. The flat screen was high enough and strategically positioned so that the guests could see the slide show just above the dancing couple’s heads. That way, family and friends could enjoy them both simultaneously. Seeing memories of the past on the flat screen while watching the couple dance in front of it drew oohs and aahs of appreciation along with laughter and a few tears. 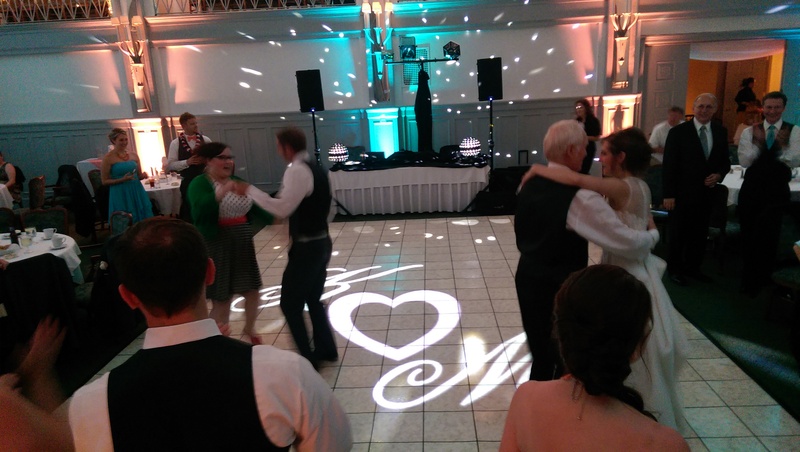 The Binghamton Club has a perfect wall space for the projected monogram, but the monogram can also be projected on the dancefloor by mounting the projector on a light stand up high and pointing it down to the dancefloor per the following photo. 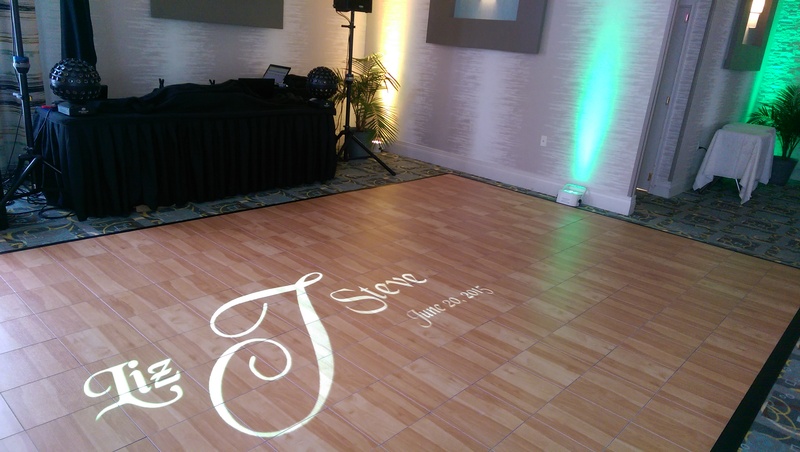 A projected monogram on the dancefloor. As far as the music selection, Michelle and Mike left it up to me to read the crowd which is where a DJ’s experience and skill level really shows. The guests loved it! I am equally comfortable with couples who give me a list of favorites to work in for maximum fun and dancing spontenaity. At this reception, there was a pretty good mix of ages, so I worked hard to choose songs that the majority of them would know and enjoy. They just kept dancing all night! One of the ways to personalize your wedding reception is to put more of YOU into it. The biggest ‘YOU’ is who you decide to invite as your guests; your family and your closest friends. So, the best way to further personalize your reception is add things that include and involve your family and closest friends. Choose things that help them to socialize. Help them to celebrate with you and with each other. Take food for example: The bride and groom personalize the menu, but every person is included in the meal and every person can get involved together. 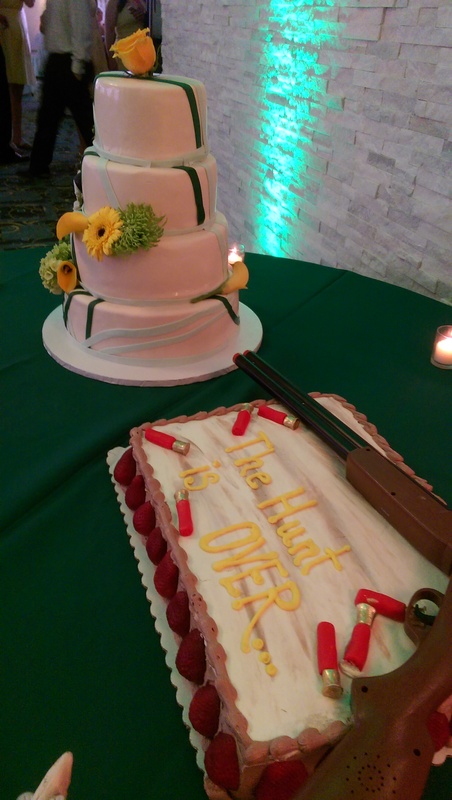 Dining with the bride and groom is a personalized celebratory experience for everyone alike. 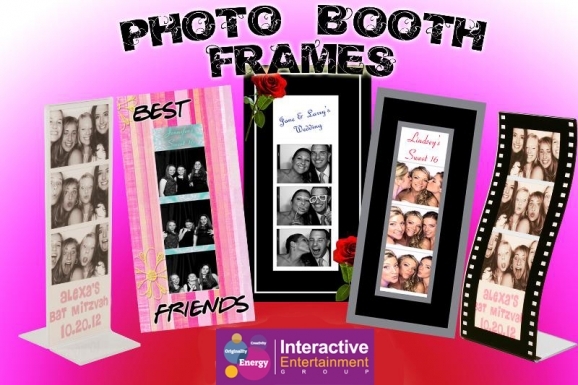 I believe that a photo booth can provide a similar personalized experience for both the bridal couple and their guests. It helps people to socialize while giving each person the freedom to celebrate in their own way. Below are 9 of the ways I see this happening. 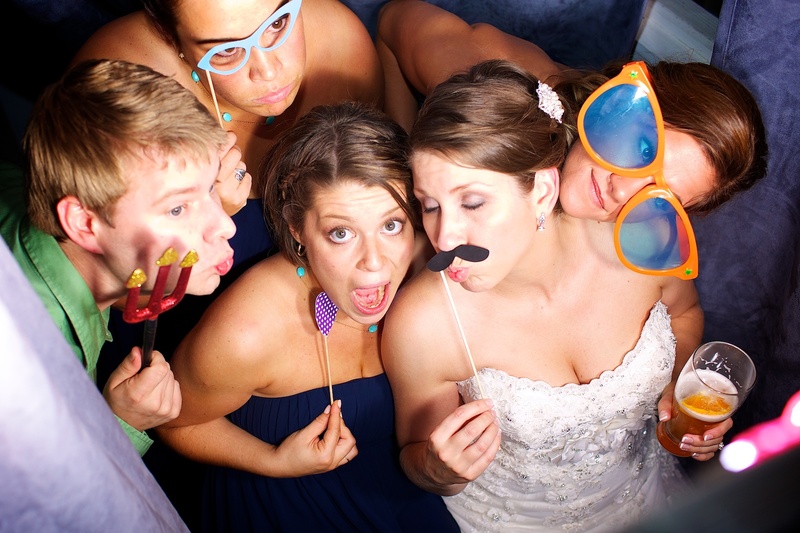 #1) A photo booth is something that your guests can DO instead of watching! But gosh, wouldn’t it be fun for them to DO something too? Like take pictures and write things in your scrapbooked photo guestbook that you receive at the end! 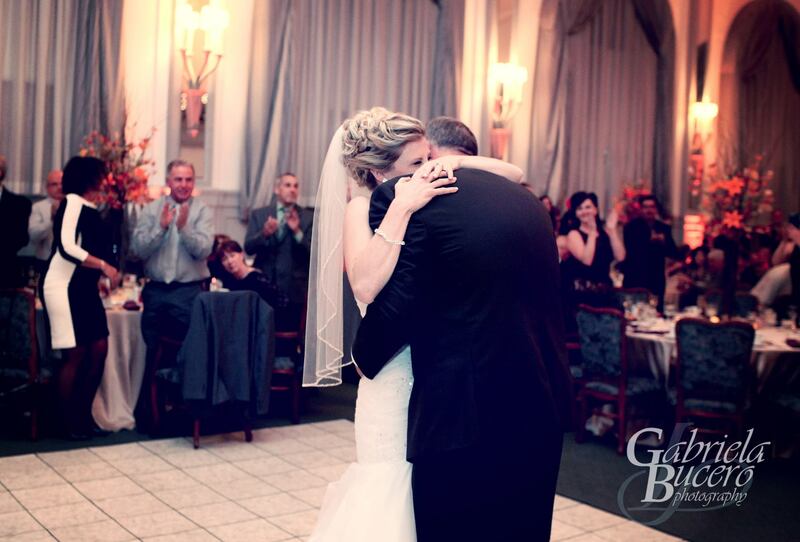 #2) Guests get to see their own picture right next to your name and your wedding date! But hey! Don’t you think they’d like to get their picture taken too? And not with a cell phone – that is too every-day-ho-hum-ishy. They want to get their picture taken in your official instant-printing-out-on-real-photo-paper-wedding-day-photo-booth! It helps that their photo strip is customized with your names, wedding colors, and wedding date. Afterall, you are the celebrities and everybody wants to be with you on your wedding day! #3) Your guests get to see their own picture in lights! Our photo booth has a feature that allows us to export the pictures it takes to a flat screen or projector as they are being taken. This is a way for you to share some of your spotlight with your guests, offering each of them their own 60 seconds of fame at your reception. #4 People start laughing behind that curtain! It is amazing how much fun people have with a camera behind a curtain! They forget their problems and become like kids again -just having genuine FUN! There is nothing more personal than that! 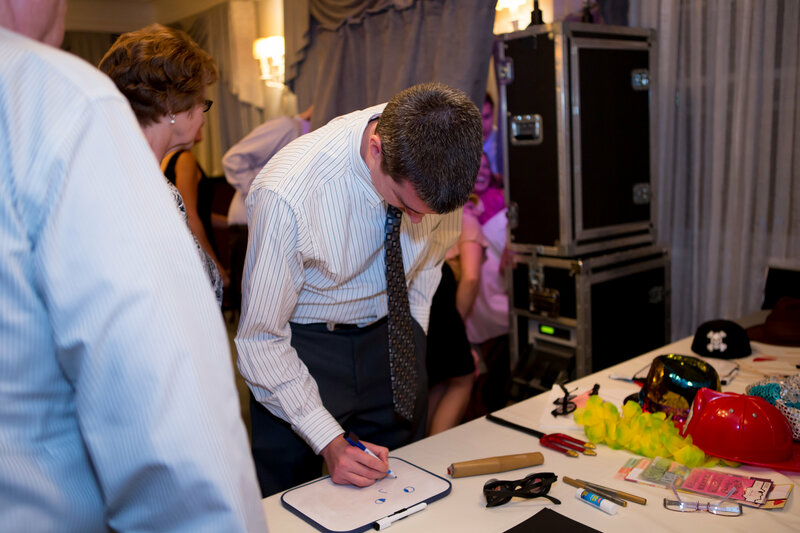 #5) Your guests get to use their own creativity to pose for their pictures and to write their own well-wishes to you! 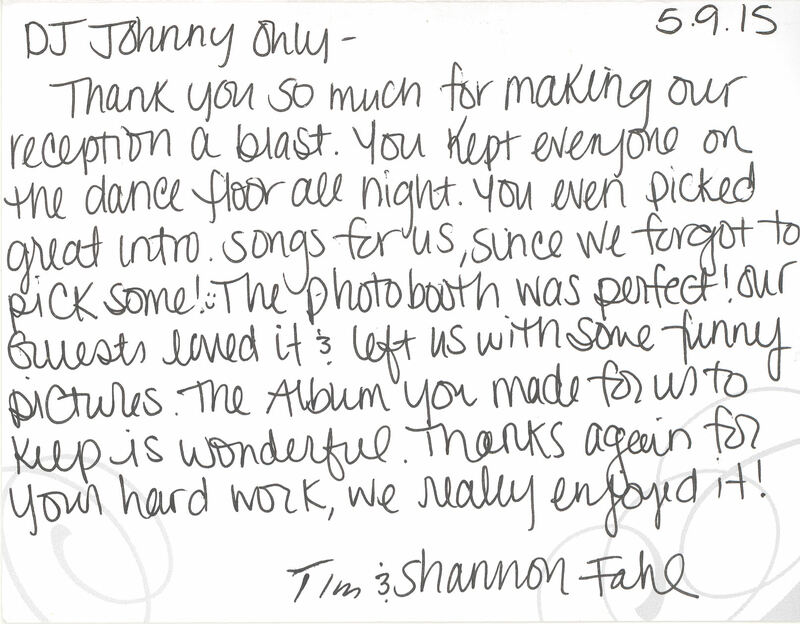 They also write unrelated, funny and/or unexpectedly sweet things to you in your photo guestbook (that we provide) – I am always surprised how creative people become as the evening progresses! People really ‘get into it’ and that is the ultimate personalization! 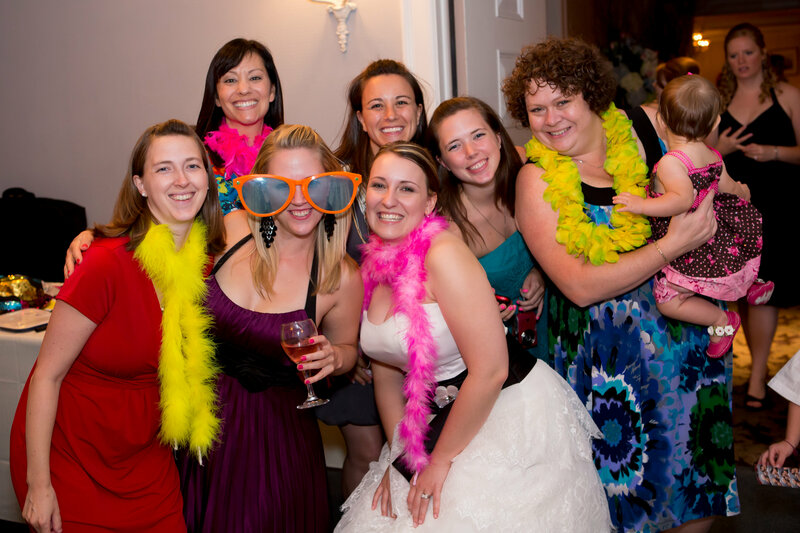 #6) Our photo booth helps your guests to socialize by delivering a uniquely personal experience! 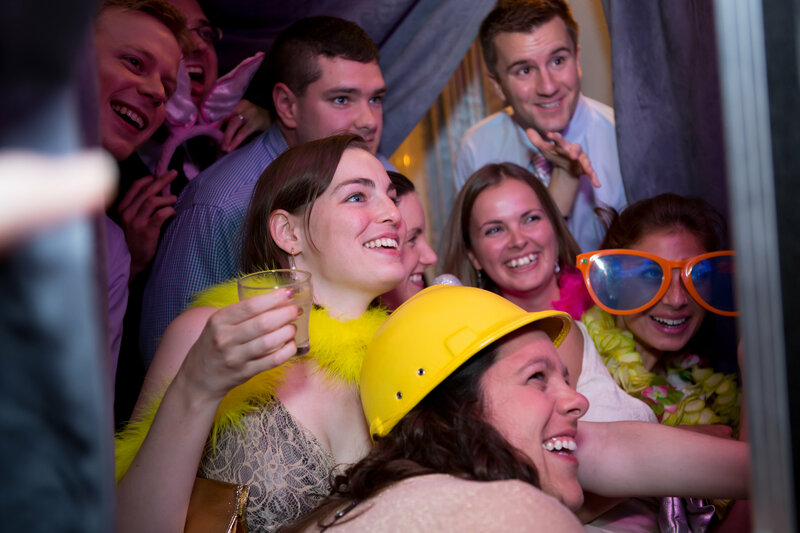 Not only do guests connect by getting in the photo together, but we also supply props with our photo booth that help people to drop their guard and be more … human. What could be better to help build new family ties and to help solidify old ones? 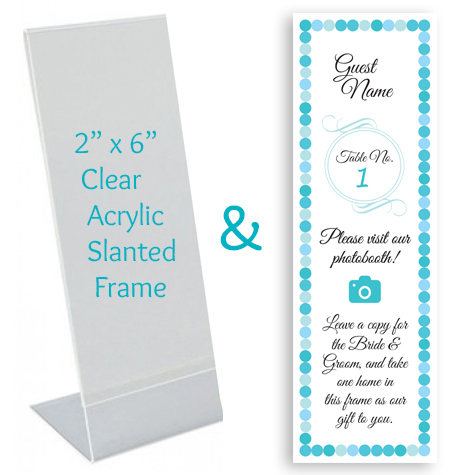 #7) You can personalize a placecard that fits in a photo booth frame. The placecard can be in the frame that is going to hold the photo strip and it can include instructions about the photo booth. Most couples choose 2 x 6 photo strips, but our booth can be set to print out 4 x 6 as well, so you could do 4 x 6 frames if you wanted. All dressed up for a wedding? What better time is there for a couple to get a photo? 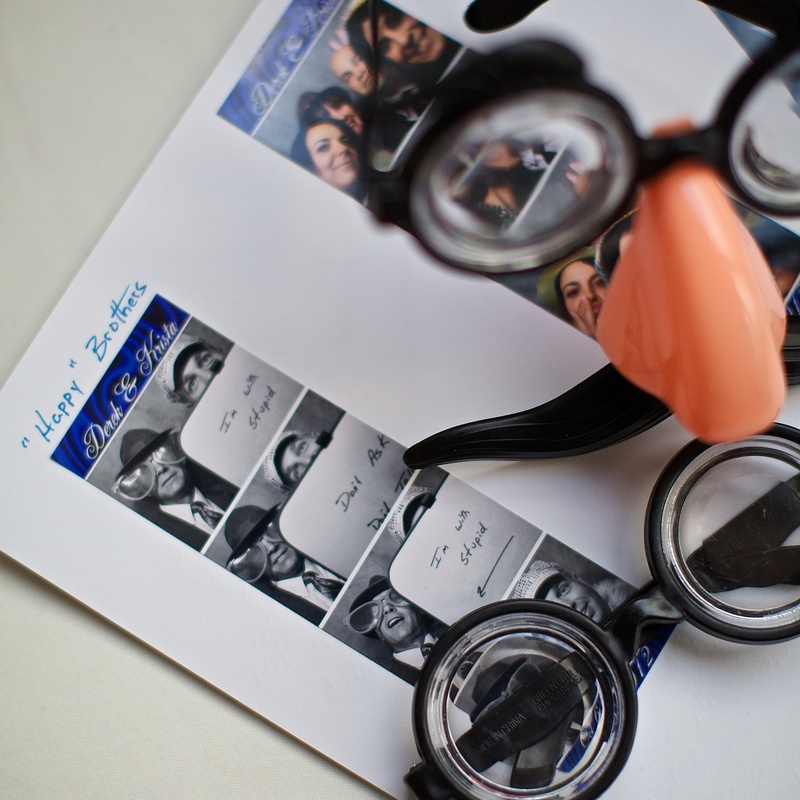 #8) Your Guests get to take home a photo strip as a highly personalized wedding favor. My favorite idea is to offer them a protective sleeve with a magnetized back for the photostrips. Your wedding favor to them is going to stay on the refridgerator and be talked about everytime they open the door -for decades! It has your names/date with their picture. 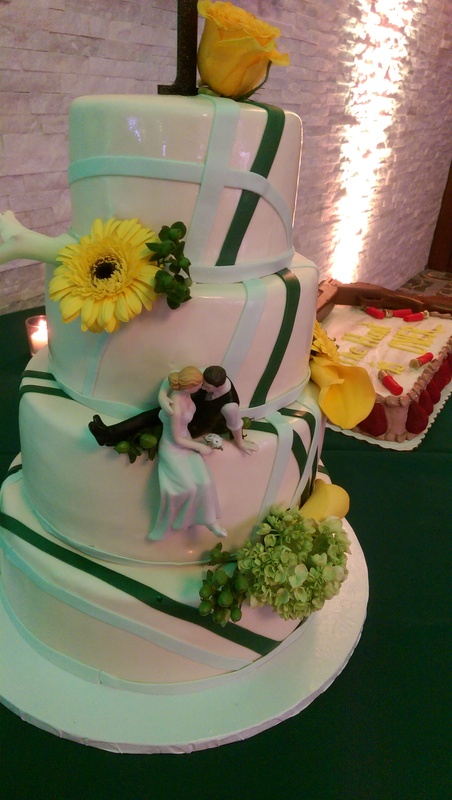 They will keep it forever and like your love for one another, your wedding reception will never be forgotton! 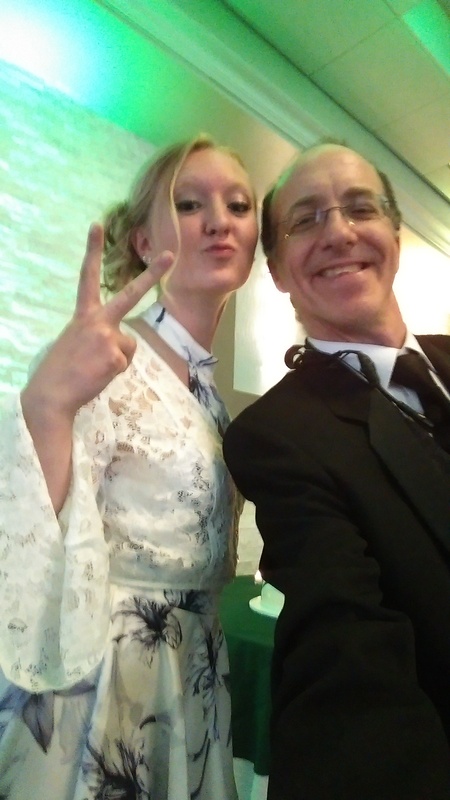 #9) You get a kick out of emailing their high resolution photos afterwards. You receive all of the digital images on a flashdrive at the end of your reception. Email them to your guests or post them on their facebook timelines as blackmail photos, renewed connections, smiles, laughter and things to talk about long after your reception is over! All of those benefits, just because you added a photo booth! Now that is what I call personalization! I was the DJ for the first wedding reception in the Carousel Ballroom of the Binghamton Holiday Inn last weekend. 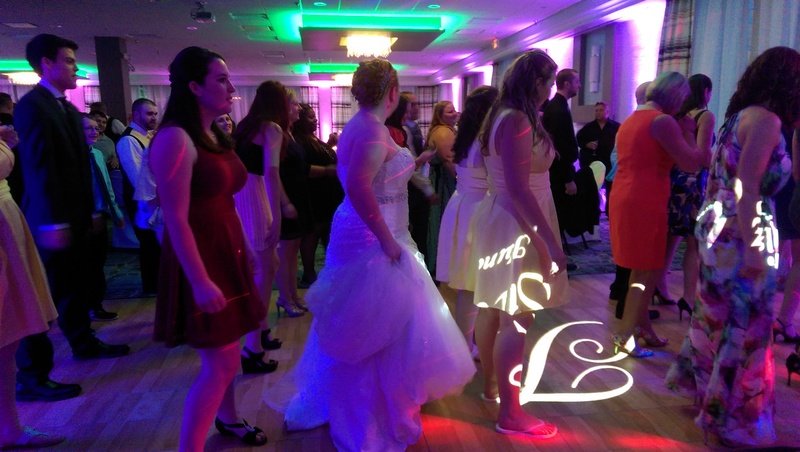 Enhanced by uplighting and a projected monogram, the reception was as elegant as it was fun! Uplights near the cake help to bring out the wedding colors. Green on one side, yellow on the other for balance. The uplights behind wedding soloist Hannah make her even more beautiful than usual! Professional vocalist, Hannah Truman performed at the ceremony. Contact her at hannah.truman@cortland.edu if you need a soloist. Notice how uplighting brings life to the room even while sunshine is still streaming in through the windows. Looking even more striking during the dancing! Absolutely radiant shining through the brides dress! Added visual excitement during the dancing as the uplights change color to fit the mood. Made possible because my uplights are wirelessly controlled from my computer. Fully curtain enclosed photo booth to double the fun. More and yes, even more.